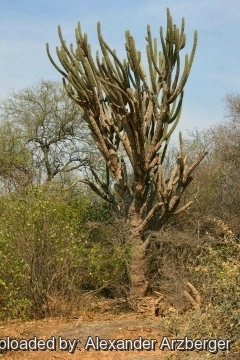 Origin and Habitat: Stetsonia coryne is endemic to the Chaco region. It occurs in Argentina in Catamarca, Córdoba, Chaco, Formosa, Jujuy, La Rioja, Salta, Santiago del Estero, and Santa Fe, in Bolivia in Santa Cruz and Tarija, and in Paraguay. Altitude range: It grows between 200 and 1,000 metres above sea level. 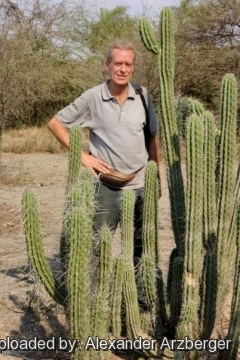 Habitat and Ecology: This cactus grows in low mountains and plains, often at the edges of salt flats in Chaco forest and similar habitats in Bolivia and Paraguay. It is widespread where it occurs and is locally abundant and forms dense groves. Plants sprout readily from cleared land, and colonies form part of the first succession of the plant community. Thus, they also appear to benefit from heavy grazing, for once they are established and send out their potent, long spines, cattle leave them alone. Stetsonia coryne demands relatively flat lands, tolerating a wide range of soils, including dense clays that deter other shrubs and trees. It is almost totally absent from slopes. It also seems to flourish in saline soils, though the plants growing in salty soils sometimes look scrofulous. There are no major threats to this species. However, buffelgrass (Pennisetum ciliare) an aggressive African forage grass, has been introduced into the region in recent years, and its penchant and need for fire may pose a dire threat to the Stetsonia coryne continued prosperity. Stetsonia coryne f. cristata hort. 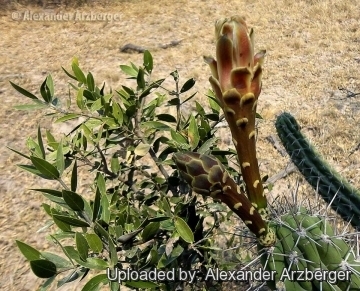 Description: Stetsonia coryne, the only species of the genus Stetsonia, is a large, massive, tree-like columnar cactus that grows to a height of 3-10 m tall and is one of the most striking features of hot desert regions in Argentina. In outline, the plants resemble somewhat the many-branched Polaskia chichipe and Polaskia chende of Mexico's Valle de Tehuacan, branching quickly and prolifically from a short trunk to present an overall appearance of an inverted triangle set on a post. 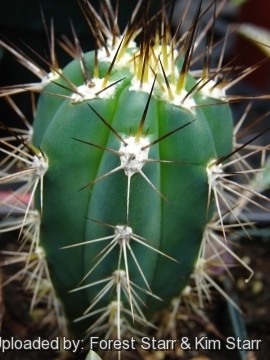 It is among the most famous cacti for the fiercely spines that cover the trunk and should prove an interesting and eye-catching plant for the specialist collector and for those wanting a somewhat different plant. Stem: S. coryne has a very short trunk from which sprout numerous, up to 100 or more up-right and ascending, stout branches that branch again above and form a broad head. Ribs: 8-9 high, blunt, and more or less scalloped. Spines: 6-9 of unequal length, the biggest 5-10 cm long, straight, sturdy, and sharp enough to be used as toothpicks, hence the common name. At first white, the spines gradually become black. Stems: Deeply ribbed, with new growth emerging purplish blue-green and ageing to olive green. Flowers: Solitary from the upper parts of the branches, large white tinted pink. Perianth tube 12-15 cm long with spreading tepals that form a bloom as wide as the length of the tube. Stamens numerous. The large white flowers open at night bat remain open 'till mid-morning and are thus probably pollinated by bats. Blooming season: Mature plants (more than 25 years old) bloom in spring or summer (January and February) and they fruit in autumn (March and April). 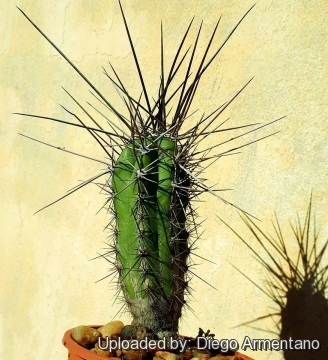 2) Forest & Kim Starr “Stetsonia coryne (Toothpick cactus)”. Plants of Hawaii. <http://www.starrenvironmental.com>. Downloaded on 20 August 2014. 8) Oakley, L. & Pin, A. 2013. “Stetsonia coryne.” The IUCN Red List of Threatened Species. Version 2014.2. <www.iucnredlist.org>. Downloaded on 26 September 2014. 9) Wikipedia contributors. "Stetsonia coryne." Wikipedia, The Free Encyclopedia. Wikipedia, The Free Encyclopedia, 7 Sep. 2014. Web. 26 Sep. 2014. 10) Urs Eggli, Leonard E. Newton “Etymological Dictionary of Succulent Plant Names.” Birkhäuser, 2004. Cultivation and Propagation: Commonly known in cultivation only as young, small plants. 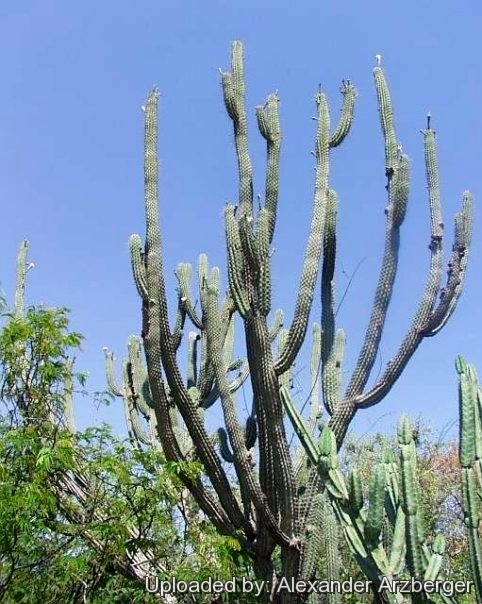 Stetsonia coryne has by many cactus fanciers been found more difficult to grow than many other tree cactuses, but may grow large and form beautiful specimens with time. Soil: Furnish good drainage and use a an open and free draining mineral compost that allows therefore roots to breath. Exposure: Need full sun avoiding only the harshest summer sun, if kept too dark they may become overly lush and greener and could be prone to rotting due to over watering. Hardiness Frost Tolerant as low as -4°C (or possibly colder) but in cultivation it is best to avoid any frost when during the winter the temperature can go down to 2° C without any harm so long as the compost is very dry. During the summer it is best to keep the plants outside where the temperature can rise to over 30 C with no harm to the plant. Keep well ventilated as it is prone to root rot. Use: This species is used in many ways. Humans eat the fruit, and animals extract its water when chewing it. The fruits, appearing in late summer, are smooth skinned and have a lemony flavour. 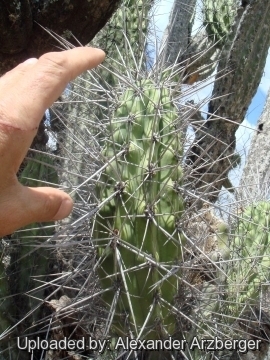 They appear to be one of only a few columnar cacti fruits whose rind is edible raw. The mass of black seeds embedded within white pulp is usually cooked, another unusual characteristic of the fruits, but can also be eaten raw. 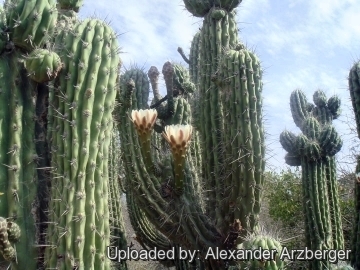 It can be used as live fences, the thorns are used as needles, the wood is used to make furniture and crafts, and it can also be used for medical or ornamental purposes. 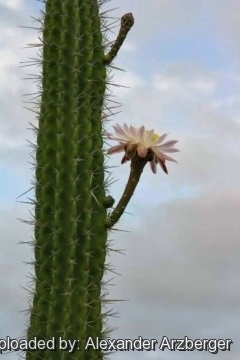 The inner cortex dies and rots when the plant dies, leaving an attactive, often straight cylinder, ideal for the "rain sticks" popular with tourists.